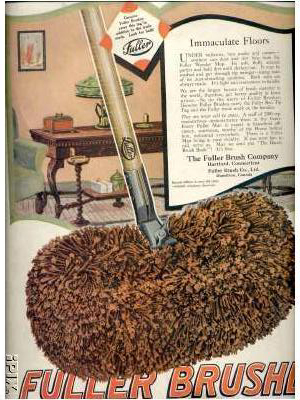 The Fuller Brush Company was founded January 1, 1906, by Alfred C. Fuller, a businessman from Nova Scotia, Canada. 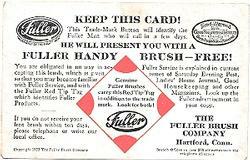 The company was actually called The Boston Brush Co. then in Massachusetts.Alfred lived in Somerville Massachusetts.When Alfred moved to Hartford his business was renamed to Hartford Brush Co. before it became the Fuller Brush Co. 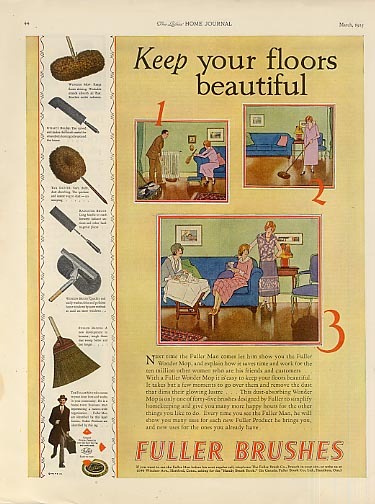 The company began with door-to-door sales of brushes of various sorts, including hairbrushes with a lifetime guarantee for which they are famous. Since 1973, Fuller Brushes and over 2,000 other products have been manufactured near Great Bend, Kansas in Barton County. 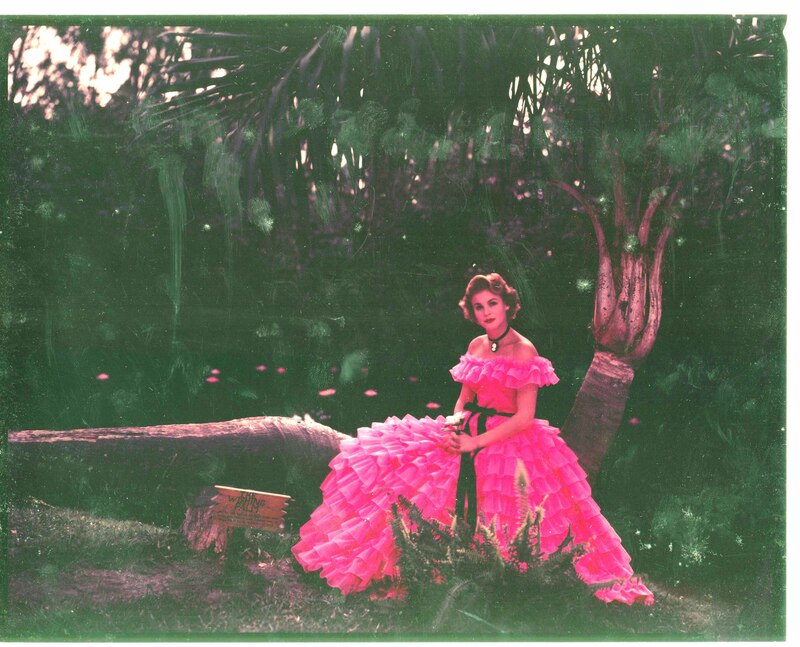 "Fuller Bush Girl" was the title of a 1941 comedy movie starring Lucille Ball and Eddie Albert. 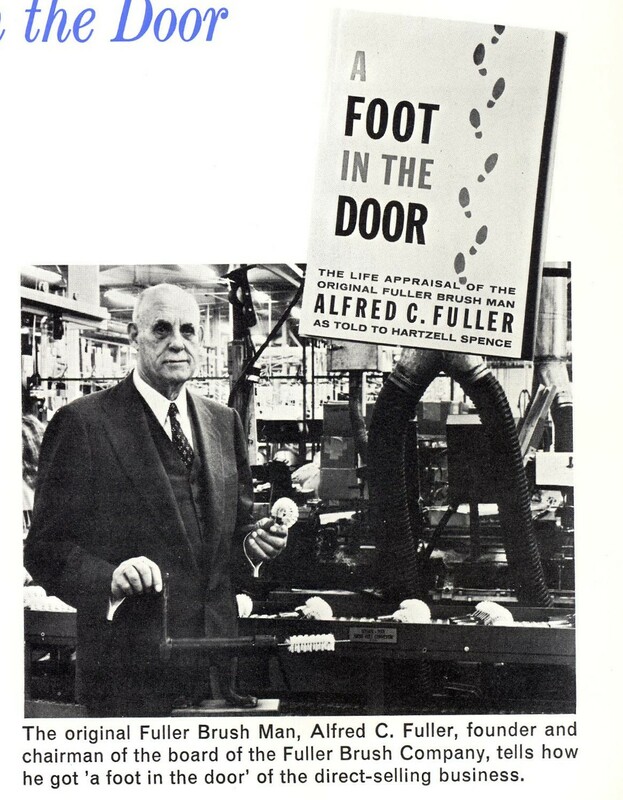 Old Man Fuller (Alfred) became Chairman of the Board. Howard (46) & wife Dora Baker Fuller were killed in an auto accident in 1959. Alfred was driving a rare gull wing Mercedes sports car in Nevada on May 10th, 1959.. 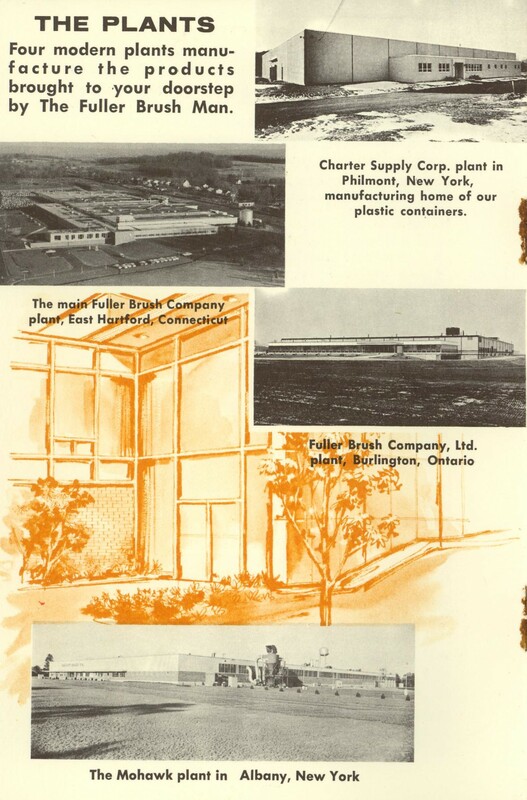 The building of the new East Hartford plant started in summer of 1958. The move occurred in Jan 1960. 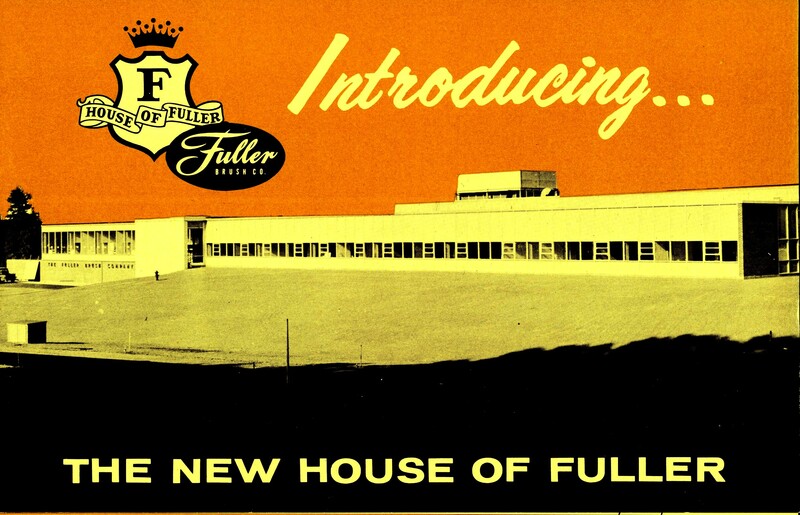 The Fuller Brush Company factory was located in East Hartford, Connecticut during the 1960s. It had moved from Hartford some years earlier. 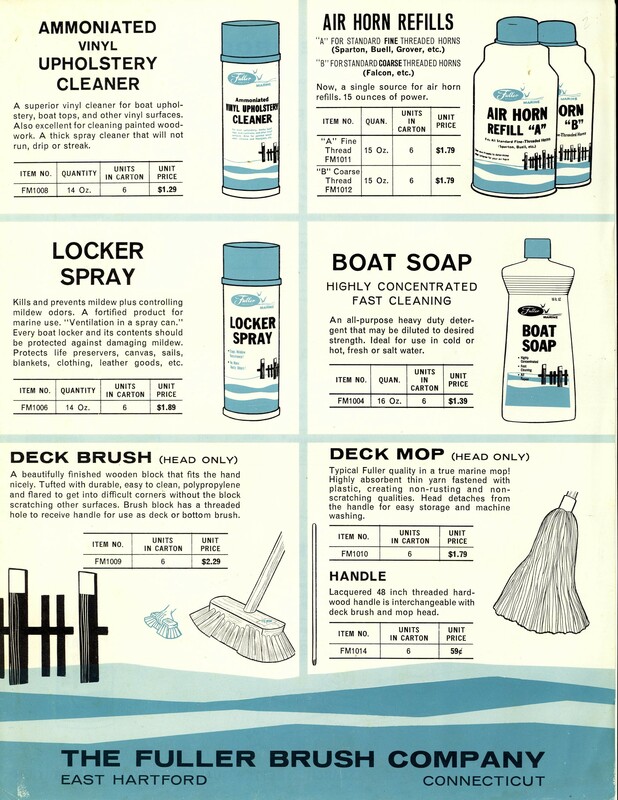 In the early 70s the company was bought out (after Mr. Fuller’s death) and moved to Kansas. East Hartford Plant At that plant Mr. Fuller's son Avard ran the company. In 1960s they were using a Honeywell 200 computer to monitor the workings of 22,000 dealers in the country & world.The location was 88 Longhill Street in East Hartford. The toothbrush operation & warehouse was in Philmont, NY which was located on a major East-West & North-South major highway junction. 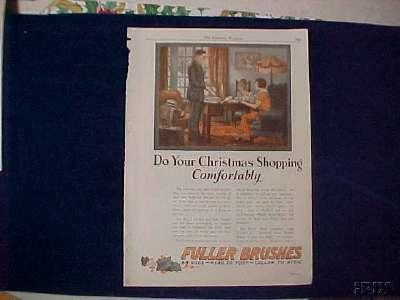 It was said at the time at least 70% of the toothbrushes in the USA were made by Fuller. Dr West was one of those brands made by Fuller in Philmont. This was also where the blow molding of plastic bottles was done. 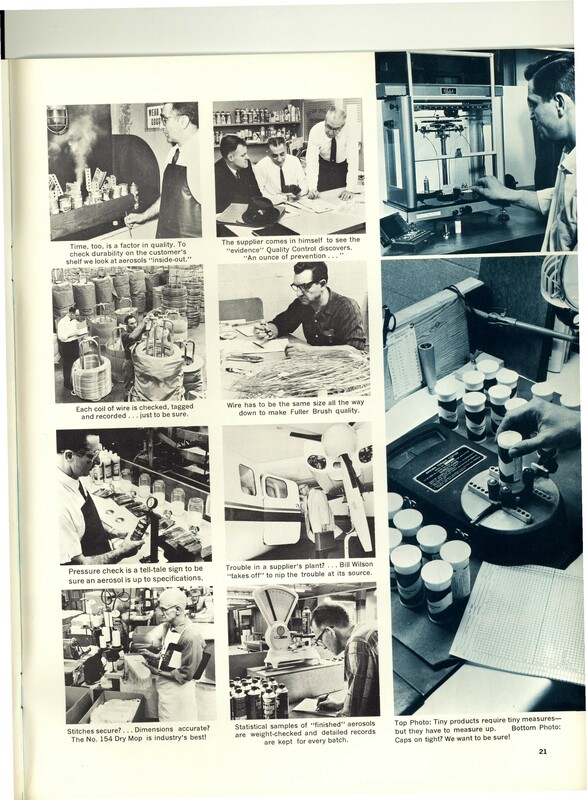 The Burlington Ontario plant in 1960s was in the plans in 1959 based on newspaper articles. 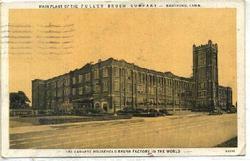 The present Canadian Plant is located in Thornhill, Ontario & Called "Fuller Brush Industrial". 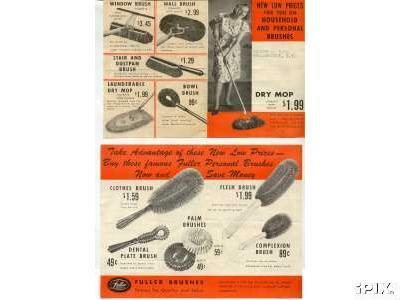 Located at 1512-7825 Bayview Ave.
Fuller Brush was bought & moved to Kansas in 1973. It employed 700 employees. I am not sure how many moved from Hartford area.At least one called me to find out about the town it was moving to as I had been there. I told them if you were up wind of the stockyards you were OK! You also could eat cheep beef stake for all three meals! The big question is, how did the Fuller move to Kansas effect the Great Bend families? House prices? Employment, etc? The Research Department was there along with the plastics molding operation. The Research Dept tested sample bottles for leakage over time. It developed it's own electric toothbrush, but finally went with a Japaneese brand that was superior & less costly. It had a Tineous Olsen tester for metals in stress. The Research Department (Catch All Dept!) had Hank Whitman as the Supervisor. Mr. Jim Davis was my imediated supervisor. A James D. Smith was the Mechanical Engineer who graduated from LSU. Jim Smith worked alot on the Stainless Steel Scrubbie machine & I spent time working for or with him.. 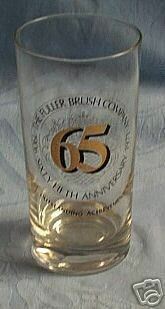 The Exaust brush research was being done by J.L. Harding in 1962.I still have a copy of his test reports. * The cost analysis for new products or new production methods. * The machine deign for production. * The secretary's last name was Taylor. * There was a small silk screening box. * There was at least one chemical use area with hood to take any hazardous vapors away. * There must have been a sensitive scale as I remember small bottles of purfume samples being weighed to determine evaporation over time. The industrial brush division was also at the plant where they made large motor driven brushes for developing newspaper printing photo metal plates. 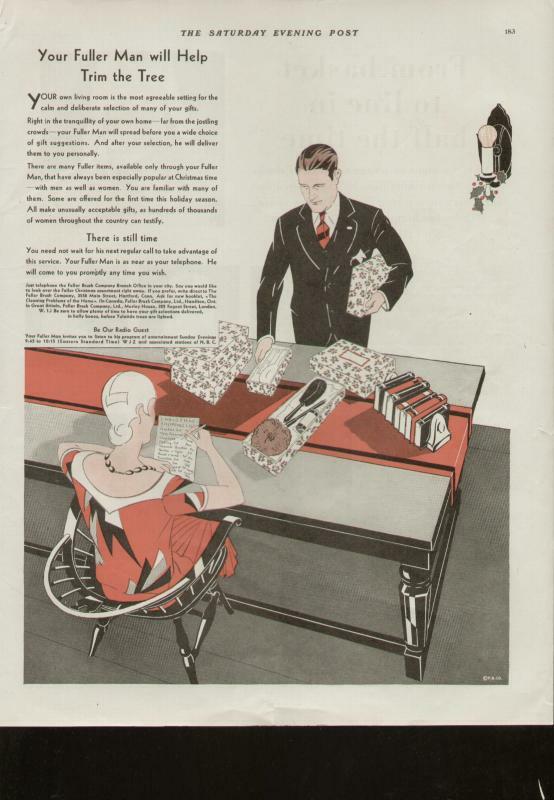 The perfuming operation was there also, including a large machine to detect what was in perfume made by other companies.The head purfumer was going to nose training classes in NY every week so he could snif & recognize contents of purfumes.Eugene ( Gene) Press was his name. All the mops (wet & dry) were sewn at this plant.They were using a lock stitch pattern & were always saying there was big money for anyone that could invent a sewing machine with an automatic rewind bobbin.It was many yrs later when someone did! * At the plant there was a blind man who bent brush assemblies all day long, he became blind during WWII from being a Japanese prisoner of war forced to arc weld without protective glasses.Nice guy to talk to! 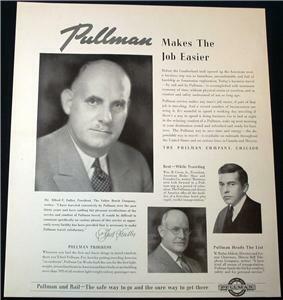 Fuller had given their entire corn broom manufacturing equipment to a blind organization to use. In front of the East Hartford plant was a large glass case with a stuffed large boar that represented the boar hair used in some of the original brushes. 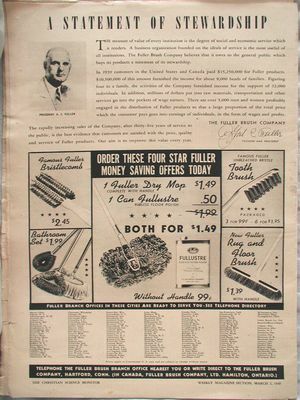 Fuller had a "private label" division Charter Products that sold duplicate products under brand names chosen by the distributor. 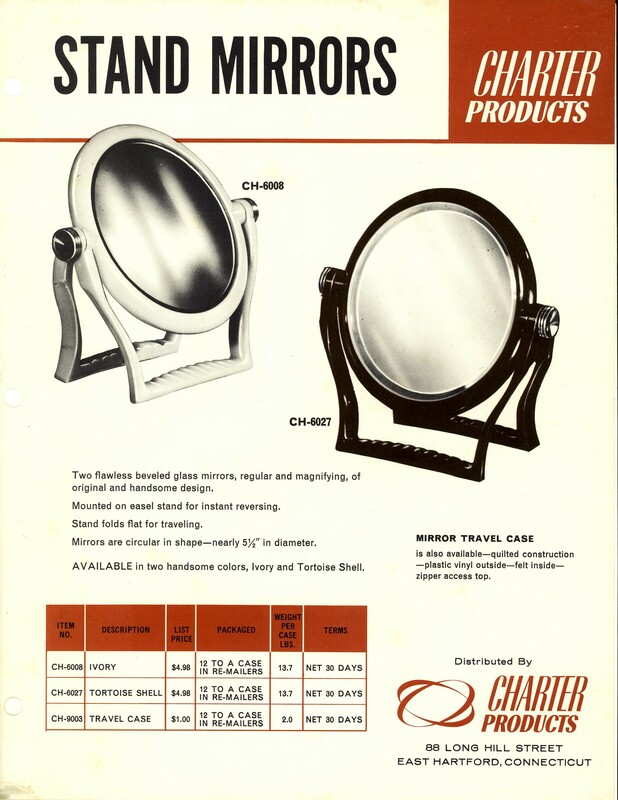 The "Stand Mirror" that was retired as old design was revived to start the line. I had abt. 50 made for me to buy (my own money) & test market myself. I did the cost analysis & Fuller had them made. Avard's interest in boating resulted in experiments at the plant with plastic molding of port lights (windows) for boats including plastic hardware.It was to be part of the Marine Division.I still have one of the grey plastic port lights & some of the plastic hardware. Soon a photo will be posted.The origional test item was round and abt 12 inches in diameter. I remember going on the roof of the plant every morning for a period to throw salt water on the port light test models! The research dept had made aluminum molds to power the plastic material in. The clear plastic cover was injection molded, because I remember the large sprew attached the Research Dept. had to cut off & buff the top till it was flat & clear to see through. The plastic hardware was not holding up well to the wear. The threads would not take the many fastnings & the pull test of the bolts were poor!Some test models stuck with the brass hardware as standard.
" PORT LIGHTS FOR YACHTS and boats of various types are one of the many unusual items being manufactured at the FULLER Brush Co. plant here at Great Bend. These are molded of plastic fitted with a plexiglass cover to be water proof, and also include a separate screen unit so they may be opened to provide fresh air when desired. Here, Mrs. Peter Ccgalas, 4912 Lakin, displays one of the finished products. THESE PORT LIGHTS are an original FULLER design inspired by members of the FULLER family." The plant contained a large warehouse that was also served by a Railroad siding. The stainless steel scrubbies were made there also. Jonny Fuller the grandson of Alfred & son of Avard use to raced a P-? Volvo sports car at Thompson Speedway SCCA track in the 1960s. This was in Thompson Conn. John had a super loud exaust as it was a tuned for ( engine speed) racing exaust.John used to work on his race car in the large opening doors area in the back side of the East Hartford plant.
. Carol Ketchum worked on the cosmetics line at Fuller, she was the Canadian niece of Alfred by his first wife.She took me into meet Alfred & get his autograph on his book. I still have alot of color photos of Carol I took with a professional camera. Joseph B. Burns became the VP of Fuller in Jan 1964. Fuller was working on an auto exaust muffler using stainless steel brush helix shaped brush.I still have one of the internal reports on their testing.One of the ideas was to build a muffler with this coiled brush so you could pull it out and go racing on weekends. * The Fuller Brush Club House on Hartford's Main Street had an explosion in 1950 from a boy trying to commit suicide. The boy was the only one injured from the gas in the kitchen. * Fuller Mgt. always said their company was Inflation proof as their sales sored during depressions as more people without work took to selling door to door. 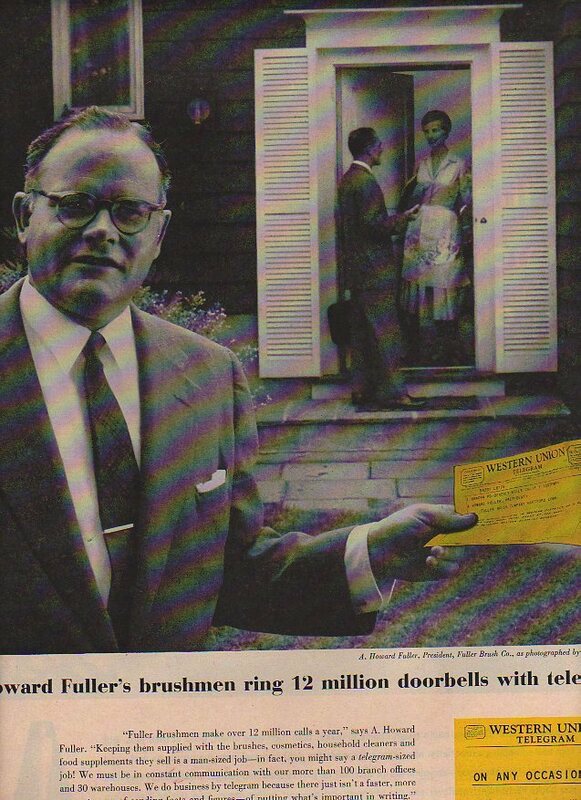 Fuller was sold & moved from East Hartford to Great Bend Kansas in Aug 1968. Later, the Union Carbide Co. made disposable diapers in the plant. Consolidated Foods became Sara Lee Corporation. 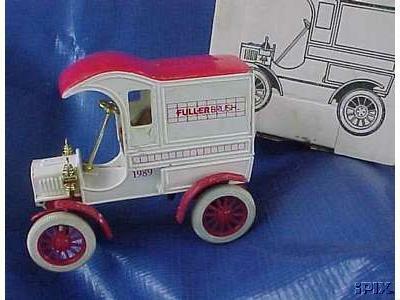 Fuller again sold to CPAC (1994). 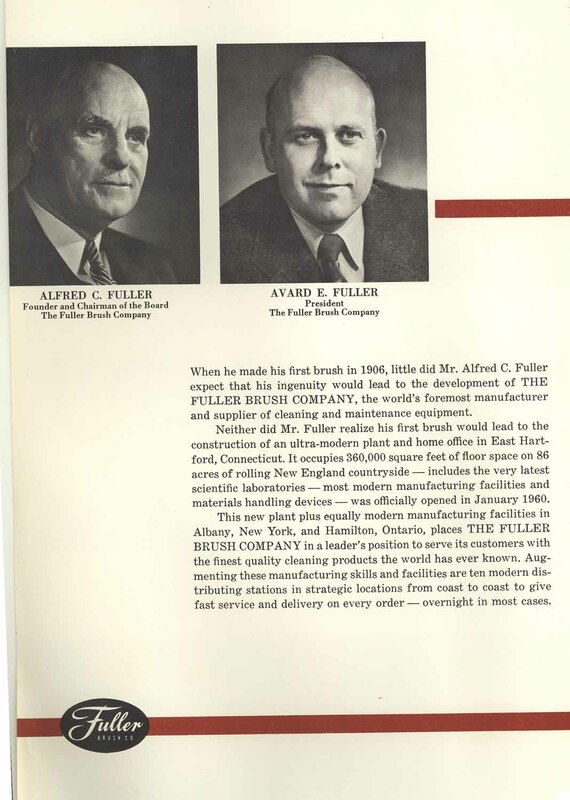 Sara Lee Corp. sold Fuller Brush to Computerized Pollution Abatement Corporation (CPAC). In 1920, Alfred (42) was in Hartford with wife Evelyn (40) & two kids, Howard A. (6) & Avard E. (3 yrs & 9 months). They had a nurse, Martha Bothwell (32), cook Rose Peterson (28) & a general man Tony Billinger (33). Alfred was listed as owner of Brush Factory. In 1930, Alfred (55) & wife was 52? he was executive of Brush Factory & came to US in 1905. He was listed as 1st married at age 24. I was involved with this line starting & developing of the Stand Mirror (old line) for the start. Fuller Brush Pin Saved for photos of the Fuller Port Light development model from 1965 period in Nest Hartford. 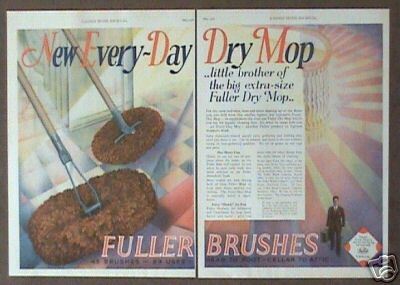 Sample of an 8X10 Color Transparency done for Fuller Brush Add Dept. Date & Photographer unk. This is one of may in my photo history collection.Taken pre 1960s!